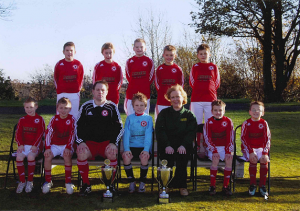 We were established in 1991 with one team, U11’s, playing in the then Barnsley Junior League. Now we have teams in the Millennium League, Huddersfield and District Junior League, Sheffield and District U18’s League and the Girls Development League. We became part of the Shaw Lane Community Sports Association in 2004. Last season we adopted the Griffin logo, which is being used by all the clubs associated with Shaw Lane. Hemsworth Miners Welfare Football Club was born out of the old Hemsworth Colliery Football Club which was disbanded in 1980 with the new Hemsworth M.W.F.C forming in 1981. Football can be traced back to 1920 involving Hemsworth Colliery FC but it’s thought teams played in the village of Fitzwilliam as early as 1904, 3 years after the opening of Hemsworth Colliery. The Colliery was opened on land belonging to the Earl of Fitzwilliam and named after the nearest town which was Hemsworth. Hemsworth Colliery F.C had some outstanding teams and players over the years with notable achievements including winning the local district cup during world war 2 and winning the Supplementary Cup 4 years on the trot. During the 1960’s there were several other honours that graced the trophy cabinet. With the closure of the pit, the football team eventually disbanded but reformed in 1981 as Hemsworth Miners Welfare Football Club. 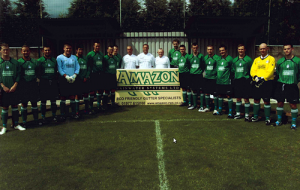 Amazon Rainwater Systems were contacted by the club with a request for Sponsorship approximately 3 years ago. We have provided Home and Away Kits for the team. 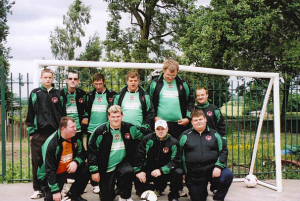 Amazon Rainwater Systems Ltd contacted Joys Hall a couple of years ago after reading a newspaper article about how they were forming a football team to play in the National Disability Football League. After discussion with Joys Hall we felt that their aims and objectives gave great opportunities for the community and decided we were happy to provide football kits for the team members. Managing director Philip Hand said “It’s a great pleasure to see young people enjoying football and we wish them all the very best in the forthcoming season”.